Battlefield 1 is getting a free map next week, and you can get a preview of it in a livestream later today. Next week, Battlefield 1 will be getting a new free multiplayer map, Giant's Shadow. Set during the Battle of the Selee in France, it will be centered around a crashed zeppelin. 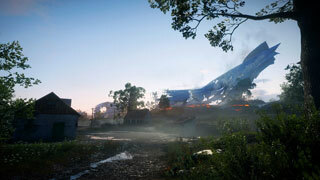 The armored train will make an appearance, and players will be able to utilize horses and planes. Also included is a new weapon: the grenade-launcher crossbow. It's an option for the support class, and its official description reads, "Based on one of many unique contraptions from the Great War, this gadget can silently fire two grenades of either the Fragmentation or High Explosive variety." Once Giant's Shadow is released, Battlefield 1 fans can look forward to the first paid expansion, They Shall Not Pass, which is scheduled to launch in March 2017.